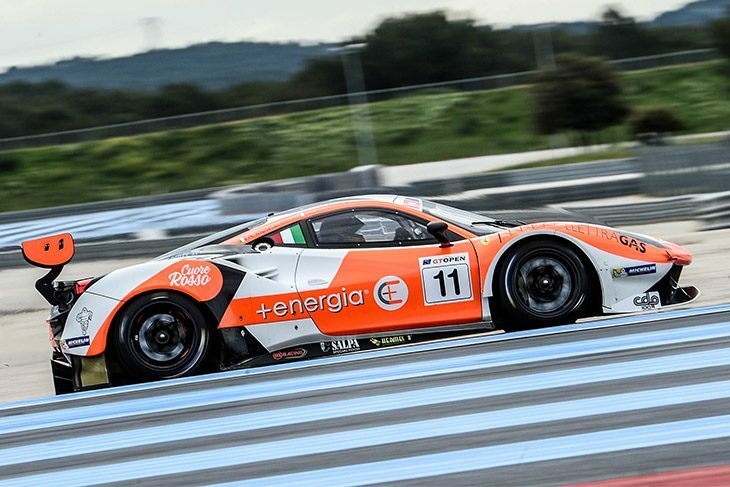 Andrea Montermini and Daniele Di Amato took victory in the second International GT Open race at Paul Ricard, thanks to a crucial move from Montermini in the #11 RS Racing Ferrari just five minutes from the finish. As the 60 minute encounter got underway, pole-sitter Thomas Jäger (#72 Lechner Mercedes) had a far better start than Mikkel Mac in the #51 Luzich Racing Ferrari, who had to defend from third place starter Andrés Saravia (#47 Teo Martin BMW). Going into Turn 3, Mac and Saravia were side-by-side, with Mac holding the inside. As they rounded the turn, the nose of Saravia’s M6 GT3 was ahead, but Mac held his ground and squeezed Saravia off-line. Saravia cut across Paul Ricard’s vast run-off and came back onto the track at turn five in second place. The incident was investigated, but since Saravia would have likely gained the place had he been given room, no further action was taken. A lap later, sixth-placed Giovanni Venturini’s #63 Imperiale Lamborghini slowed at turn five. A puncture was the cause, putting the reigning champion almost a lap down by the time he had exited pits with replacement rubber, and further hindering the Italian’s title defence. Venturini wasn’t the only source of woe at Imperiale either; the sister #25 of Riccardo Agostini also suffered a puncture – on the left rear, just like Venturini – and both cars finished outside the points. 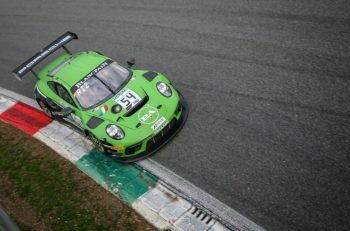 Race leader Thomas Jäger held a gap of just under three seconds for a majority of the first portion of the race, while Mac tried and failed to find a Ferrari 488-sized gap anywhere on track to pass Saravia. In the pits, two minutes before the mid-race pit-window opened, Alberto Di Folco had been called into the pits in the #90 Target Racing Lamborghini, seemingly to be checked over. In a moment of Di Folco exited the car and looked bemused when he realised his teammate was not there to jump in. After some gesturing between he and the mechanics, he jumped back into the Huracan GT3. Once the pit window was open, Saravia came in at the first opportunity. After the success of he and Fran Rueda in the #47 Teo Martin BMW on Saturday, they had 15 seconds of success penalty time in the pits, which would put them on the back foot for the second half of the race. Meanwhile, with another strong performance in the first race, Mikkel Mac’s #51 Luzich Racing Ferrari was held for an additional 30 seconds before Marco Cioci could take over the car. As the pit window came to a close, Mario Plachutta received the PRO-AM and overall race leading #72 Lechner Mercedes from Thomas Jäger. There were only eight seconds between Plachutta and the PRO class front-runners, fronted by Lourenço Beirão da Veiga in the #3 Teo Martin BMW, which only had to remain in the pits for the minimum time of 70 seconds. Soon enough, Plachutta had been caught by da Veiga, however, they weren’t strictly racing each other. The #63 Imperiale Lamborghini, which was now in the hands of Jeroen Mul, was stuck between Plachutta and the chasing pair, da Veiga and Andrea Montermini in the #11 RS Racing Ferrari. Mul had no intention of letting the rest of the leading pack by and was instead looking to pass Plachutta to get back on the lead lap. After three laps of trying, Mul managed to find a gap on the inside at the final turn, making his way past Plachutta. This allowed da Veiga to set up Plachutta at Turn 1, and he made it stick. The door was also open for Montermini, and the opportunistic Italian didn’t need to be asked twice. While the two PRO cars had passed, it shouldn’t have been a worry for Plachutta as he still had a good advantage in PRO-AM. However, just moments after he was fighting for the overall lead, the Lechner Mercedes came to a stop at the end of the Mistral Straight. Plachutta’s race was over, allowing the #16 Drivex Mercedes of Marcelo Hahn to inherit the class lead, which he would ultimately hold until the end of the race. 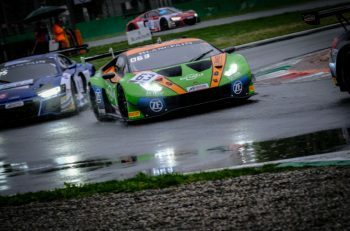 The battle for the lead was still bottled up behind Jeroen Mul in the #63 Imperiale Lamborghini, which allowed Fran Rueda (#47 Teo Martin BMW) to join da Veiga and Montermini in battle. Mul was eventually given blue flags with seven minutes of racing left to go and allowed all three leading cars by. On the next lap, at Turn 5, Montermini saw a small gap on the inside and wedged his Ferrari into it. He and da Veiga were side-by-side on the short run to Turn 6, and the Italian driver held his line to finally take the lead. Before da Veiga could even think of where to try and mount a counter-attack, he found himself under pressure from Rueda in the sister car. Rueda looked to try and make a move at the Mistral Chicane, but was unsuccessful, and the BMW battle ultimately allowed Montermini to gap the pair and take victory in the #11 RS Racing Ferrari. Da Veiga (#3 Teo Martin BMW) held on to second place ahead of Rueda in the sister #47 entry, with Damiano Fioravanti (#12 Ombra Racing Lamborghini) and Marco Cioci (#51 Luzich Racing Ferrari) rounding out the top five, ahead of PRO-AM winner Marcelo Hahn (#16 Drivex Mercedes). The AM result went down to the wire, with Miro Konôpka (#9 ARC Bratislava Lamborghini) just holding off Alexander Hrachowina in the #74 MS Racing Mercedes. The next round of the International GT Open takes place at Spa on June 9-10. Despite a relatively anonymous race weekend for Mikkel Mac, he will go to Belgium with a 13 point lead in the overall standings.